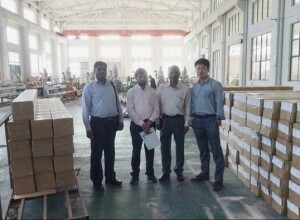 At the beginning of the year,one Brazil customer make a call to us and informed us,he would come to our factory to check his goods,we were welcomed his coming.Then we help him to order the ticket,after he arrived Shijiazhuang airport,we and our boss drive to met him,then we back to our factory to check our production process and check his goods,we were highly estimated. After visiting our factory,we have a pleasant dinner.He told us he will not worry about the products quality,and will establish the long-term business relationship with us. After three days,we dispatch him to the airport and he thanks for our warm reception. This visit strengthen our business relationship.